Birmingham Corporation started work on the 'Elan Valley Reservoir' scheme after gaining Royal Assent to its Birmingham Corporation Act 1892. Subsequently the corporation decided that further parliamentary powers were required as amendments and additions were needed to the original scheme. 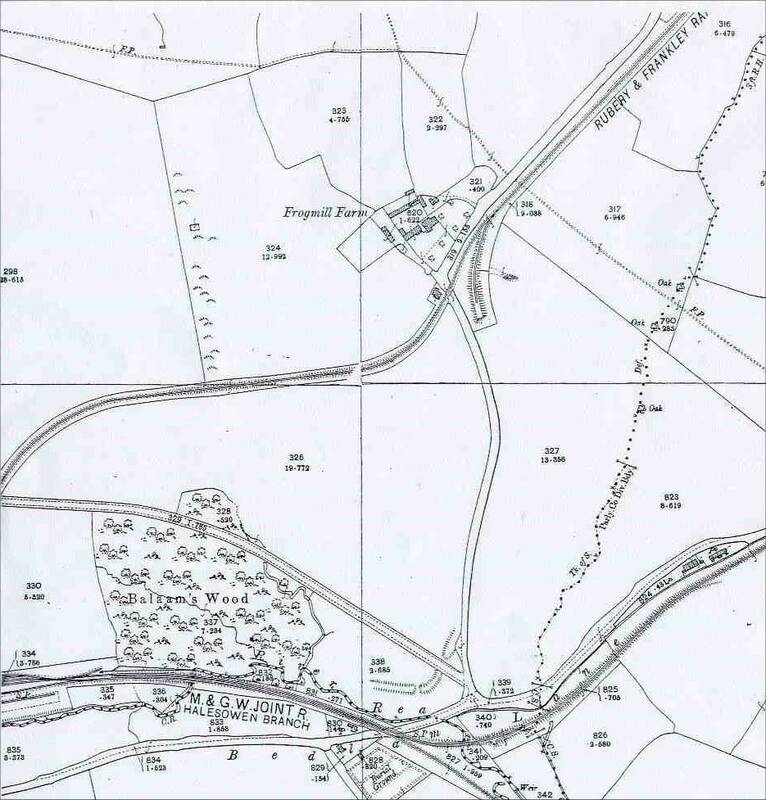 On 4th October 1895, the Water Committee was advised of Council Minute No.16841 that required that 'For the construction of the reservoir, filter beds and other works at Frankley a large quantity of stone, cement and other materials will have to be conveyed from Rubery Station. Under existing circumstances these would have to be carted over hilly country roads at heavy expense. In the application to Parliament it is proposed to construct a short railway from Rubery Station to the property of the corporation at Frankley as the cost of conveyance by rail even taking into consideration the cost of making the railway will effect a saving as compared with cartage. The railway will be about a mile in length and will pass wholly over the property of one landowner with whom negotiations have been opened'. These negotiations evidently proceeded satisfactorily because on 26th November 1895, the Water Committee was able to report to the Council that 'your committee have practically arranged with Lord Cobham the only landowner interested on what they consider to be reasonable terms'. The Birmingham Corporation Water Act 1896 gained Royal Assent on 2nd July 1896 and authorised the construction of the branch line of just under a mile in length from the north end of the existing sidings at Rubery Station to a field known as 'Cutler's Rough' that was part of the site for the intended water works at Frankley. The corporation then set about selecting a contractor to build the reservoir at Frankley and a package of works including the building of the standard gauge railway (and three crossing keeper's cottages) from Rubery Station to Frankley was let to Abram Kellett of Ealing at a total cost of £314,428 9s 2d and construction of the railway commenced in 1897. The Water Committee advised the Council (Minute No.17517) on 1st February 1898 that 'the construction of the railway from Rubery Station to the works is now almost complete and the contractor has made some progress towards getting his plant on the ground and erecting huts for the workmen'. The single track railway started at Rubery station, ran north over a level crossing at New Street (the crossing keepers' cottage still survives) past Frogmill farm (where there was a runaways siding and another level crossing and Egghill Lane (where there was a level crossing and cottage), between Northfield reservoir and the housing estate, to enter the Frankley reservoir site mid-way between the wood and Frankley Lodge Farm. The track bed is clearly visible at this point. In addition Kellett also used narrow gauge locomotives, presumably at the Frankley Reservoir end of the works. After the completion of the contract with Kellett for the construction of the reservoir there was no further use for the railway although the tracks remained in situ until the First World War when the connection with the railway at Rubery was severed and the tracks were lifted. The dependence of the corporation on the pipeline from the Elan Valley and the limited storage capacity of the Frankley reservoir prompted Birmingham Corporation to obtain a further Act of Parliament in 1922 to build another reservoir at Bartley Green, a little to the west of Frankley reservoir. The corporation let a contract to Edmund Nuttall, Sons & Co Ltd for the construction of the Bartley reservoir. Once again the sidings at Rubery Station were used during the construction work. A narrow gauge (2'0”) railway was laid down along the trackbed of the Rubery & Frankley Railway. At the Frankley Reservoir end the railway was extended beyond its former terminus to a central concrete mixing plant situated near to the junction of Scotland Road and Frankley Lane. Stone for the construction of Bartley reservoir was carried to Rubery Station by steam lorry from the nearby Rubery Hill Quarry and loaded onto narrow gauge trucks for conveyance to the construction site. (Source : The Railways of Rubery and the Lickey Hills, Frankley Library, Ref.L.385.0942). Note: When the Bartley Reservoir was built the original Scotland Lane that went direct from west to east was submerged and the road was diverted around the reservoir. 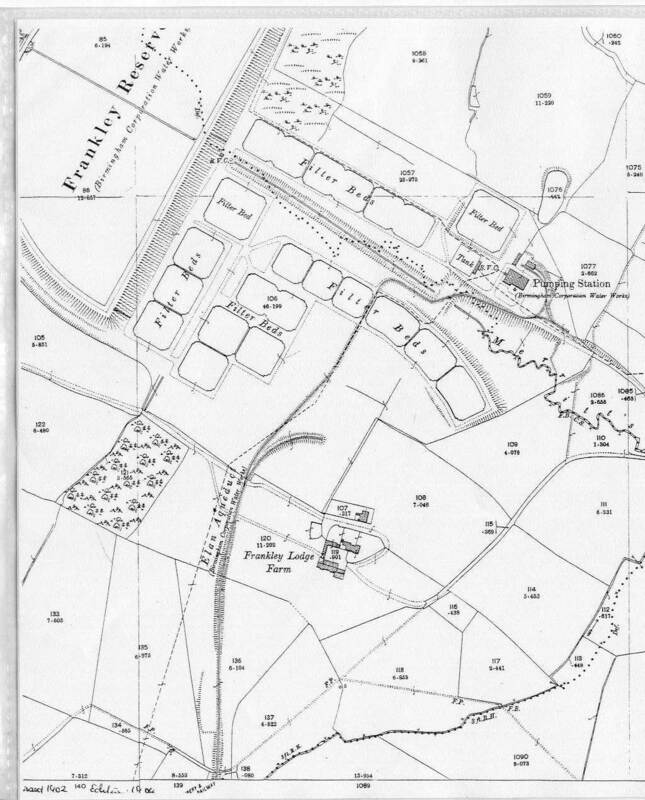 The junction of Scotland Road and Frankley Lane was therefore north of Frankley Reservoir rather than as now. The Industrial Railway Society records show that no less than seventeen 2'0” gauge Motor Rail diesel locomotives were used by Nuttall's on the Bartley Reservoir construction contract and full details can be found in their book 'Industrial Locomotives of West Midlands'. The reservoir was opened on 19th July 1930 and the railway from Rubery Station was again closed. Site Photographs taken in 2002/03. The building of the Rubery and Frankley Railway was authorised by the Birmingham Corporation Act 1896 and construction started in 1897. It had been in use for several years by the time the survey work for these two Ordnance Survey maps was done in 1902. This map shows the southern section of the branch at Rubery. Rubery Station on the Midland and Great Western Railway Halesowen line is just out of view to the left-hand side of Balaam's Wood. The branch line leaves Rubery Station sidings at the east end and turns north to cross New Road on the level before turning east to Frogmill Farm where the lane here is also crossed on the level (the building on the left hand side of the railway is the crossing keeper's cottage. A runaway siding is located here. The line then crosses Egghill Lane on the level and continues between the Northfield reservoir and the housing estate (not illustrated) to enter the Frankley Reservoir site between the wood and Frankley Lodge Farm. Maps by courtesy of Birmingham Central Library.